More than any other superhero, Spider-Man is known for having a truly incredible supporting cast. It's not just the villains, it's the ordinary people who surround Peter Parker. Love interests like Mary Jane Watson and Gwen Stacy, comedic foils like the over-the-top blowhard that is J. Jonah Jameson, and even friends-turned-enemies-turned-friends-again like Harry Osborn are all part of the fabric that make the story of Spider-Man what it is. There is, however, one member of Spidey's entourage that goes back further than any of the others. Before Mary Jane, before Jonah Jameson, and even before Aunt May and Uncle Ben, there was Eugene "Flash" Thompson. He's the single oldest supporting character in the Spider-Man saga, and as you might expect, that gives him a pretty complicated history, even by Spidey standards. From bully to best friend, from war hero to cosmic avenger, from page to screen, here's the truth about Flash Thompson. One of the most interesting things about Flash Thompson is that he's not just the oldest member of Spider-Man's supporting cast. If you want to get technical about it, he's actually the very first named character in the entire Spider-Man mythos. He appears on page one of the first Spider-Man story from 1962's Amazing Fantasy #15, and while that panel also introduces the world to Liz Allan — and, perhaps more importantly, a frowny-faced nerd named Peter Parker — Flash has the notable distinction of being the character standing on the left. That might not sound like a big deal, but believe it or not, that's actually pretty important. Because of the way word balloons are placed in a comic book page, the order in which people are positioned on the page is pretty important. If you're reading Amazing Fantasy #15 in English, then you're reading left to right, which means that the person who's speaking first should always be on the left side of the panel. Otherwise, you get criss-crossed balloons or the feeling that someone's responding to something that hasn't been said yet. 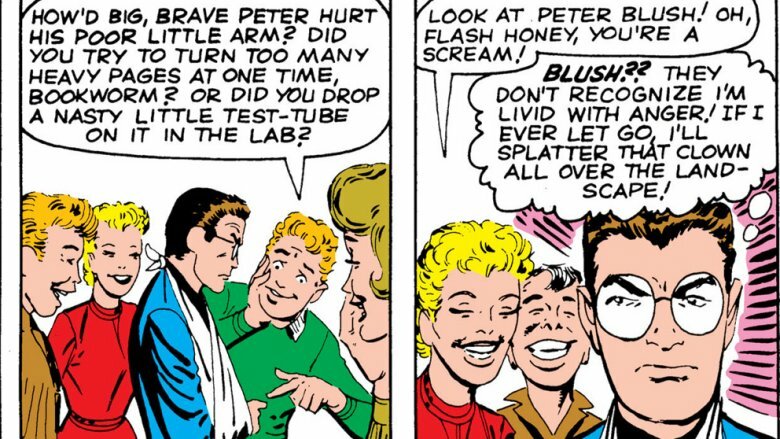 While the actual first line comes from an unnamed Midtown High student in a fashionable plaid jacket, Flash is the one we see first, and his dialogue sets up one of the most important aspects of Spider-Man's history. Unlike the wealthy and powerful superheroes that readers of the '60s knew from characters like Batman and Superman, Peter Parker's an outcast — and Flash Thompson is the guy who makes him one. He's insulting Peter from the first moment of the future Spider-Man's on-panel life, setting up a dynamic that immediately made Pete the underdog that he would always be. The thing that made Spider-Man such a revolutionary character, and contributed to his immediate appeal with audiences, was that his personal life was inextricably tied to his superheroic adventures. It wasn't just a matter of, say, Lois Lane being kidnapped and needing to be rescued in the pages of Superman, it was that the things he did as Spider-Man had a direct impact on Peter Parker's life, and the problems he had as Peter informed his actions as a super-hero, too. Along with Norman Osborn — the father of Peter's best friend who would turn out to be one of his greatest enemies — Flash Thompson is one of the best examples of how all this works. In the early days, he was portrayed as Midtown High's resident bully, the guy who saw Peter Parker as an easy target and tormented him for the amusement of his peers. It's a standard trope, but what makes it interesting is that before Peter got his spider-powers, he wasn't strong enough to stand up to Flash's bullying — and once he did have them, he was way too strong. If you've ever read a Spider-Man comic, you've probably encountered his classic maxim about power and responsibility, and Flash is the perfect illustration of that. Both Peter Parker and the fans reading his comics know that a guy who can bench press a car could shut Flash up almost effortlessly, but Peter already knows what happens when he uses his powers for personal gain. Instead, he puts on the mask, and takes all that frustration out on Doctor Octopus… which may or may not be that healthy. In older Superman stories, there was a classic setup where Lois Lane was pretty indifferent to Clark Kent, but absolutely smitten with Superman. 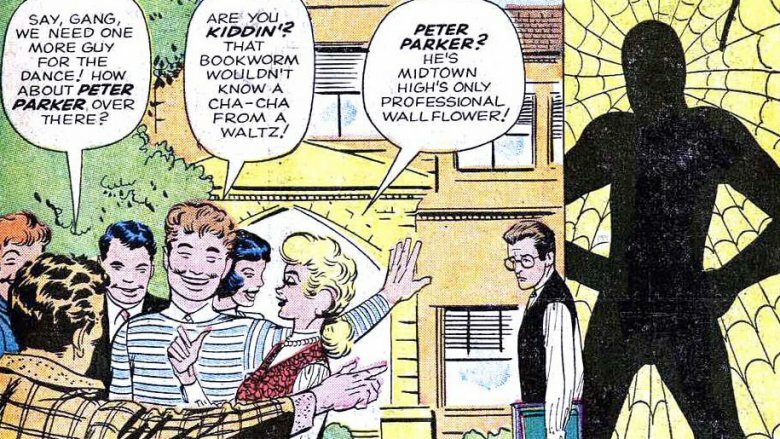 The early Spider-Man stories have the same sort of ironic dynamic, but it's not explored through romance. Instead, it comes from Flash Thompson, the guy who can't stand Peter Parker but is literally the president of the Spider-Man Fan Club. And the most ironic part? When he formed the club, he asked every single student at Midtown High to join… except Peter Parker. His hero worship of Spidey is pretty easy to understand, considering that Spider-Man's presence around Peter's school and social group meant that Spidey personally saved Flash's life on more than one occasion. It did, however, lead him to some pretty big trouble. 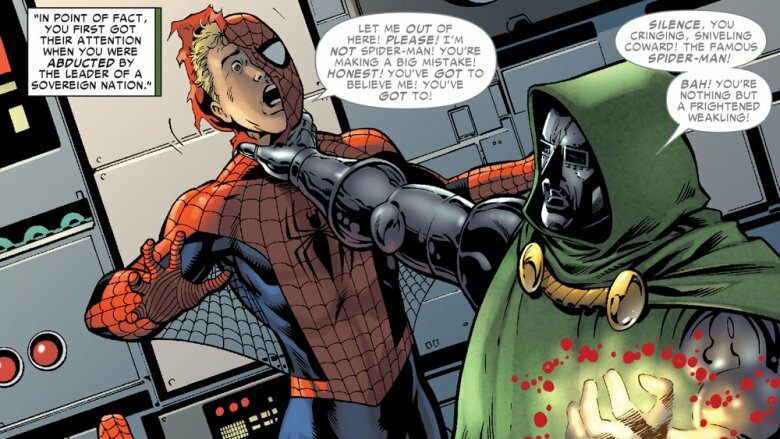 While dressing up as his hero (in order to prank Peter Parker, naturally), he was kidnapped by Doctor Doom, who assumed that he had found the genuine article. His own hero then referred to him as a "brand-X phony." Ouch. Despite Peter's initial reluctance to use his incredible strength against Flash, the tension between the two students eventually reached a breaking point. It wasn't either of them that caused it, though. Instead, a teacher named Miles Warren — who would eventually become the Gwen Stacy-obsessed cloning mastermind called the Jackal, because nobody gets out of Spidey's supporting cast without a turn as a supervillain — insisted that Thompson and Parker settle their differences in a boxing match. The result was an all-time classic tale from Spider-Man's high school era. Rather than just throwing the fight, Peter decided to avoid all of Flash's punches with his enhanced reflexes, and then hit him as lightly as he possibly could. The result of Spider-Man's gentlest punch, of course, was to knock Flash clean out of the ring. This didn't quite settle things, but by the next issue, Flash has started to realize that he'd been a little too hard on "Puny" Parker, and begins a to change his ways. There is, however, a darker subtext to the story. Years later, it was revealed that Flash's father had been physically abusive, leading to the anger that caused him to become a bully in the first place. With that in mind, Peter finally earning his respect through physical violence isn't exactly the triumphant comedic moment that it seems like in the original story. 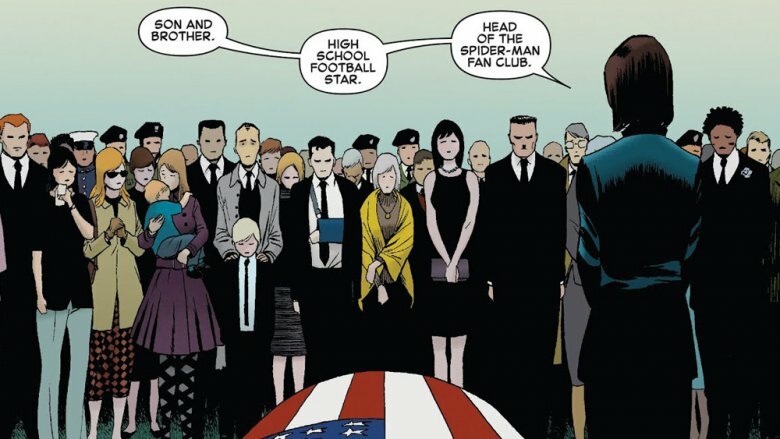 Marvel Comics has always prided itself on telling stories that were both relatable and topical. While that was pretty difficult to do in, say, Fantastic Four's stories about alien invasions, world-devouring space gods, and armored Eastern European monarchs who were also time-traveling sorcerers, Spider-Man's cast of young adults who are Just Like You made it a whole lot easier to pull off. The Amazing Spider-Man would be the host of hot-button stories like student protests and the famous issues where Harry Osborn overdosed on LSD, so it shouldn't come as a surprise that by 1967, Stan Lee and John Romita were taking on the biggest news story of the day: the Vietnam War. Of course, Peter Parker being drafted would've changed the book quite a bit, but Flash Thompson gave them an opportunity to bring that story to the cast. 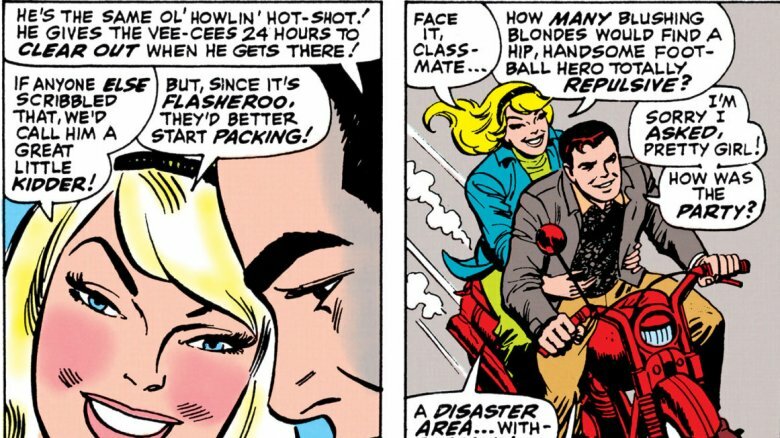 The overconfident Flash dropped out of college and gave up a football scholarship to enlist, and in one issue wrote a letter back to Gwen Stacy claiming that he was giving the Viet Cong soldiers "24 hours to clear out," or else. Later stories would dive deeper into Flash's time in Vietnam, including the reveal that he had seen a peaceful temple bombed by the United States Army, and that he'd fallen in love with a Vietnamese woman named Sha Shan who would later become his wife. Even later, she'd become his ex-wife, but the idea of Flash as a soldier stuck with the character as time moved on. 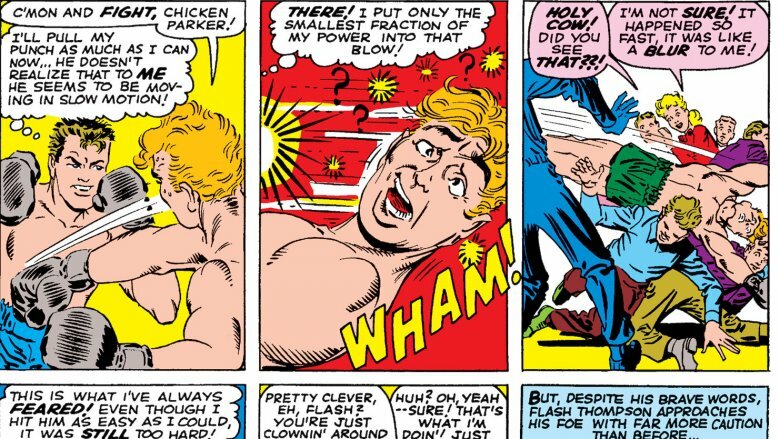 For the first 40 years or so of his existence, Flash Thompson was a relatively normal character, at least by the standards of superhero comics. He was a high school football star who never reached his potential, a reformed bully, and a veteran who had dealt with alcoholism. All of those were dramatic, but they were hardly the sort of operatic, overpowered melodrama that you'd expect from stories about radioactive spiders and deadly pumpkin bombs. And then Flash got a job as a teacher. On one level, that makes perfect sense. At the time, Peter had given up on his job as a freelance photographer and instead returned to Midtown High as a science teacher. In order to complete the image of Spidey returning to his high school years, Flash had also gotten a job at his alma mater, as — what else? — a football coach. Rounding out the cast was the school nurse, Miss Arrow, who quickly began a romantic relationship with Flash. Here's where it gets weird. Miss Arrow was not actually a nurse, nor was she actually even human. Instead, she was actually Ero, also known as "The Other," a godlike interdimensional spider totem who had taken human form by essentially shaping a pile of spiders like a woman. Her entire relationship with Flash was a means to an end, and that end involved impregnating Flash with spider-creatures that would eat him from the inside. Fortunately for Flash, that never happened, but it wouldn't be his last brush with a weird parasitic creature. The Marvel Universe operates on a sliding time scale. In short, that means that no matter what year it is, the Fantastic Four went to space, Spider-Man got his powers, and Captain America was thawed out of the ice around "13 years ago," no matter what year it is now. That means that with the exception of characters like Cap (who has the convenient excuse of the ice) and Wolverine (who is exceptionally long-lived thanks to his mutant power), the characters can't really be pinned to specific events. That's not usually a problem, but for someone like Flash Thompson or the Punisher, who have the Vietnam War in their backstory, it can lead to some pretty weird storytelling gymnastics. In Flash's case, that means that rather than serving in Vietnam, he's now portrayed as a veteran of the Iraq War — specifically that he served in the Army before, got out, did all the stuff between the 1970s and 2010, and was then called up as a reservist and sent to Iraq. This time, though, there was a lasting consequence. 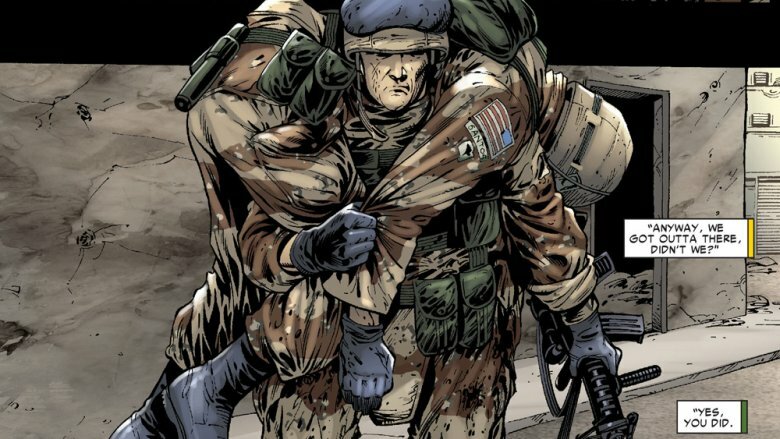 During an ambush involving an IED, one of Flash's fellow soldiers was wounded, and rather than leaving him behind, Flash — inspired, of course, by Spider-Man's heroism — went back to get him, saving his life. In the process, Flash was shot multiple times and ended up having his legs amputated below the knee, an act that earned him the Congressional Medal of Honor. But that wasn't the end of his story. You can probably guess that a guy whose name was based on his performance on the football field would be pretty upset about the loss of his legs, and you'd be right. In fact, Flash was so eager to get his legs back that volunteered for a secret government program called "Project Rebirth 2.0," which had more than its fair share of risks. As the name implies, Rebirth 2.0 was, like the original Project Rebirth, an attempt at creating a super soldier. Unlike the serum and vita-rays that made Steve Rogers into Captain America, however, this experiment was run by scientists who thought that it would be a really good idea to bond someone with the extremely powerful, extremely murderous alien symbiote known as Venom. Since Flash had proven his valor, willpower, and willingness to sacrifice himself in order to help his fellow soldiers, he was the one assigned to the project, with the idea being that he'd be temporarily bonded with the symbiote in order to go on incredibly dangerous missions, and then have it forcibly removed within 48 hours to prevent the bond from becoming permanent, like it had with Eddie Brock. Surprisingly, it worked… for a while, anyway. The Venom symbiote was able to keep the bond intact by leaving a shred of itself inside Flash when they were separated. The thing is, Flash was able to reconcile his own morality — and the somewhat twisted moral code that had been seen from the symbiote's desire to lethally protect innocent lives — and help it to recover from the trauma that had led it to be so violent in the first place. 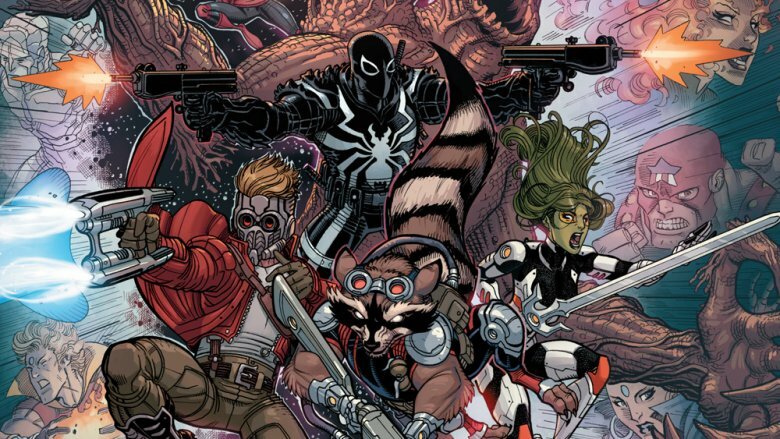 Flash Thompson: Agent of the Cosmos? As Agent Venom, Flash had plenty of weird adventures, from battling the literal forces of Hell alongside the Son of Satan to traveling to the teeny-tiny reality known as the Microverse in order to fight an itty-bitty Carnage. Perhaps the most unexpected step, though, came when he was assigned by the Avengers to join a brand-new team: the Guardians of the Galaxy. 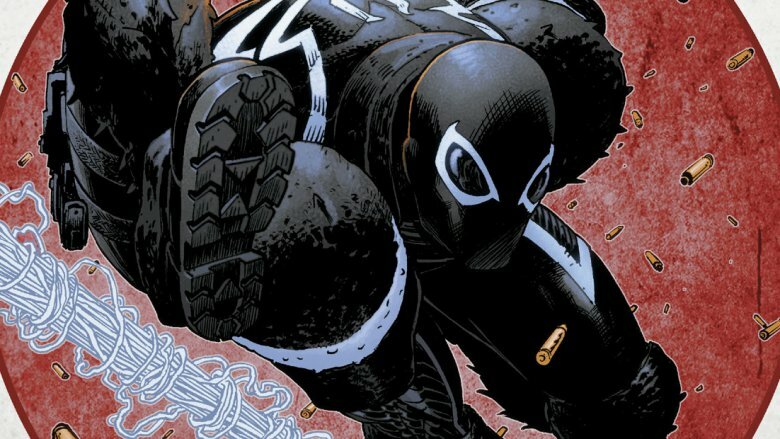 It was while he was serving alongside the Guardians that Flash discovered the true nature of the Venom symbiote. It turned out to be part of an alien race called the Klyntar, and in the distant past, it had been twisted when one of its hosts used the symbiote's power to murder everyone on his own home planet. The symbiote even took Flash to the grave-like planet to show him the consequences of its hosts' actions, but rather than rejecting the symbiote, Flash embraced it, and was able to help heal its corruption. 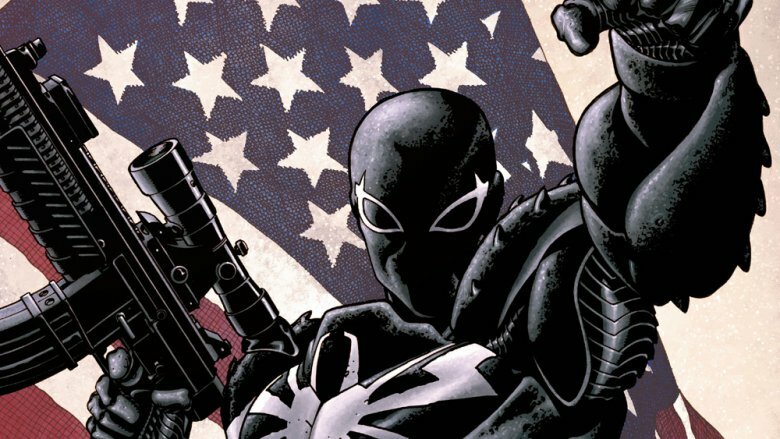 Eventually, comics being what they are, the two characters parted ways when the symbiote was reunited with Eddie Brock, who returned to the role of Venom. Still, a space-traveling cosmic warrior bonded with an alien symbiote is about as far from Midtown High as you can get. In 2018, Flash Thompson's long and storied role in the pages of Spider-Man came to an end — or seemed to, at least. At the time, he was bonded to the Anti-Venom symbiote — which is itself a pretty long story, but is essentially an artificially created symbiote that, as you might expect from the name, can neutralize symbiotes like Venom — and was pitching in to help Spider-Man fight against what might just be his ultimate foe: the Red Goblin. As a fusion of Norman Osborn and the Carnage symbiote, the Red Goblin had implanted shards of Carnage into Peter's closest friends, ensuring that he could kill them at will. Flash, however, was able to neutralize each of these shards, saving Aunt May, Mary Jane, and others before taking on Osborn himself. Sadly, the rescue mission had left him drained and unable to do the same to Osborn, who killed him before taking on Spider-Man in the climactic battle of Amazing Spider-Man #800. With that, Flash Thompson was dead. Of course, the only thing that happens more often than someone who knows Peter Parker being killed off is that they come back a few years later. For now, though, Flash is resting in peace as the result of a suitably heroic sacrifice. Whether he's the high school bully, the adult best friend, or even the host of a symbiote that sometimes ties to murder him, Flash Thompson has always had an important role in Spider-Man's story. That's evidenced by the fact that he's appeared in all three live action cinematic versions of Spider-Man. All three have cast him as the high school bully, with Joe Manganiello and a heaping helping of hair gel appearing opposite Tobey Maguire in Sam Raimi's 2002 Spider-Man film. 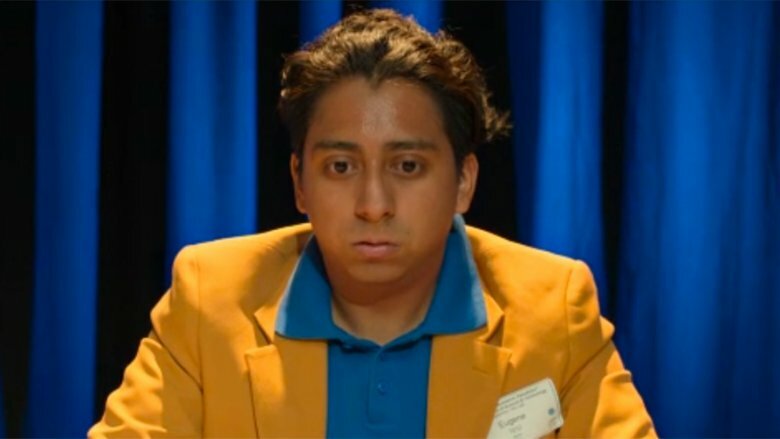 More recently, Spider-Man: Homecoming and Far From Home have seen Tony Revolori take over the role, with a pretty interesting twist. Unlike previous versions of Midtown High, the version that we see in Homecoming appears to be a school for science geniuses, and rather than a lunkhead football player, Flash is every bit as smart as Peter — and richer, too. 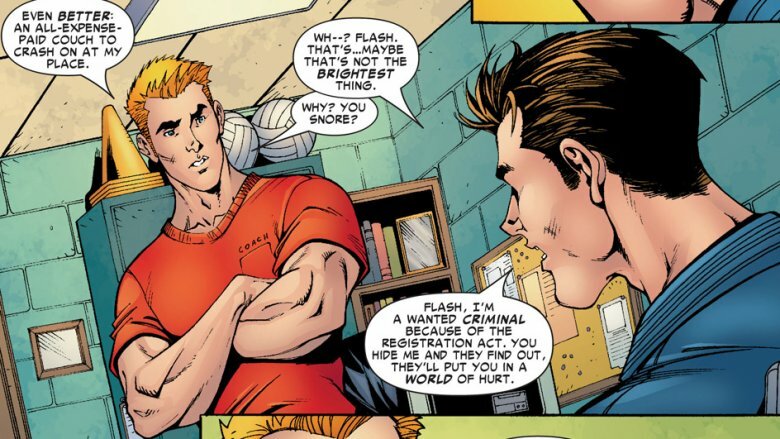 Rather than his speed on the football field, Flash's nickname apparently comes from his speed at answering questions as a member of Midtown High's Academic Decathlon team. He's still a jerk to Peter (and a huge fan of Spider-Man), though.